The Reel King Is Back! Fans of the original slot game Reel King are absolutely going to love this amazing slot game. Reel King Free Spin Frenzy slot game, brought to you by NovomaticCasino.co.uk is as exciting as it sounds. It’s like the original Reel King slot game except with tons of free spins! Players who enjoy our other slot games: Fruit Fest, Fruit Fall, Jolly Fruits and Jackpot Crown will enjoy this slot game. It’s a retro-style, 5-reel, 20 payline slot game with plenty of ways to win and it also has some really exciting features! With hundreds of positive reviews and thousands of loyal players, Reel King Free Spin Frenzy slot game is not one to be missed! The aim of the game in Reel King Free Spin Frenzy slot game is to spin at least three matching symbols on a payline on consecutive reels from left to right. When you do so, you’ll get a payout! The size of each payout will vary depending on the winning combination you’ve spun as well as your bet amount. Your bet amount is displayed at the bottom of the screen, along with your balance and your last win, and you can change it at any time by using the plus and minus buttons. You can check the paytable to see how much each combination will pay you. The symbols in R Reel King Free Spin Frenzy slot game are pretty classic and old-school. From the lowest-paying symbols to the highest-paying symbols, you’ve got the fruits, the plum and the cherries; the card values, from 10 through to the King and the pot of golden coins! In Reel King slot game, there is also a Wild symbol which can substitute for all other symbols. 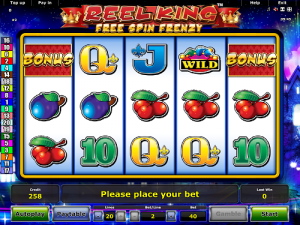 Unlike in Reel King slot game, the original, Reel King Free Spin Frenzy doesn’t have a jackpot. However, it does have something just as awesome – and that’s all of the Free Spins! the Reel King himself may make an appearance with his rotund belly full of reels. Free Spins will be triggered when you spin 3 bonus symbols! When you spin three bonus symbols, you’ll get a payout and 10 free spins! During these free spins, you’ll be taken to a different set of reels. On these other reels, the only symbol is the Reel King symbol. If any of these land and take up the whole reel, the Reel King and his belly of reels will appear. His reels will spin and give you wins and different colour sevens will give different wins, the highest payouts will be from the red sevens! Once the Reel King has spun his reels, the next free spin will start. Like most other NovomaticCasino.co.uk games, you can play for free until you’re ready to play for real. Regular players of Reel King Free Spin Frenzy slot game will enjoy taking advantage of the ‘autoplay’ feature which spins the reels automatically for you! In Reel King Free Spin Frenzy slot game, you can also gamble your wins. Choose the colour of the next card, red or black, to either double your win or lose it! Choose carefully! If you’ve enjoyed playing Reel King slot game, we’re sure you’ll love our other slots, such as: Jackpot Crown, Ultra Hot Deluxe, Sizzling Gems and Fruit Fall – and vice versa! We also offer our players the very best table games and live casino games here at NovomaticCasino.co.uk. Our live casino games bring you an authentic casino experience by allowing you to play at real tables with real dealers. Choose from: Live Poker, Live Blackjack, Live Baccarat and Live Roulette!